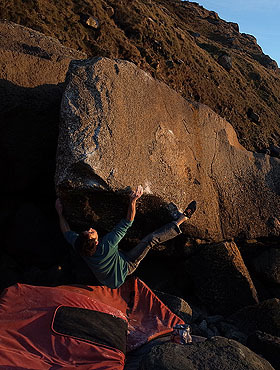 Last thing on Saturday afternoon Owen Hayward grabbed an excellent extension to his own problem School for the Gifted, which tackles the obvious undercut prow 70m beyond the Made in Heaven block at Porth Ysgo. The Thagomizer 7A+ starts sitting below and right of Larsen with a heelhook on the obvious block (left hand: crack in the roof, right hand: obvious shallow slopey dish on the right hand lip). A brilliant fridge hugging sequence leads out along the prow to the tip where you join and finish up School for the Gifted. The recent storms have moved a lot of blocks around on the Ysgo beaches, in places limiting certain sit down starts. Luckily the landing below the School for the Gifted block has improved significantly. A previously awkward block has been swept right out of the way and the back of the cave/gully has been cleaned out.